In these days of "not enough time in our lives", many of us are choosing to shop through the web, and never having to leave the comfort of our own homes seems to appeal to our needs. Battling the crowds in the malls is not my idea of enjoyment ~ I'd much rather have my dogs wrapped around my feet and a cup of tea by my side! I love to be able to really spend the time I need perusing the items I'm interested in. Especially when it comes to purchasing something unique for a special person, it's not a choice I want to make quickly. So if this sounds like an easier way for you to accomplish your own shopping, I invite you to take all the time you need while traveling through Beadazzled of Oregon's sites. We've tried to make it easy for you to accomplish your needs when it comes to choosing those very important items. Support artists: BUY HOMEMADE. It comes from my heart to yours and from yours to your special person ~ nothing can be better! Hi and Welcome to Beadazzled of Oregon ~ your web site for unique wearable beaded art! 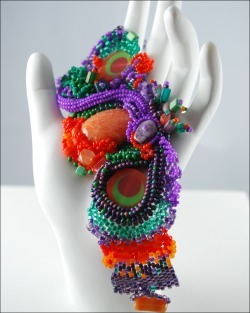 We are your place for remarkable one-of-a-kind designs in beaded wearable jewelry. By now I'm sure you have slipped your shoes off, put your feet up and taken time to browse through our studio. We want you to be assured that no piece is ever duplicated ~ they can't possibly be as the designs tumble out of my imagination with each bead I pick up, one-at-a-time! If you have enjoyed your journey here, we hope you'll return over and over again. You might add us to your Favorites for an easy connection. In the event you wish to purchase one of our creations, below are our shop policies for your information. Many thankX for stopping by! - Current Payment Options: Pay Pal, Money Order and Personal Check; your item will be shipped immediately upon receipt of money order or clearing of your personal check. - Prices INCLUDE any state sales tax if applicable. - Payment is due upon acceptance of order. - International Buyers: any and all import/handling duties/fees and/or taxes connected with this purchase are the sole responsibility of the Buyer. - Fees connected to a refusal of shipment will be the responsibility of the Buyer. - Your purchase(s) will be shipped upon receipt of payment. Any piece that is custom made to order will take longer and will be agreed upon by Buyer and Seller through communication. - All items will be carefully wrapped and boxed to ensure safe arrival. All items are listed and photographed as accurately as possible. In the event you are not satisfied with your item upon receipt, I will gladly exchange it for another item from my shop of equal or greater value, you pay the difference between the two. Return shipping costs are your responsibility. Please contact me within 5 working days to make arrangements. The item(s) must be returned unused and in their original condition and original packaging if possible. I am shipping you an item that is in perfect condition. Please remember that a handbeaded item is a delicate piece of art. Be careful when you put it on and take it off. It is a wise idea to keep your piece of jewelry in an individual bag or baggie - tossing it in the drawer with other items is not a good idea! Your privacy is my total concern. I will never sell or share your personal information with any other entity. Thank you for your trust.